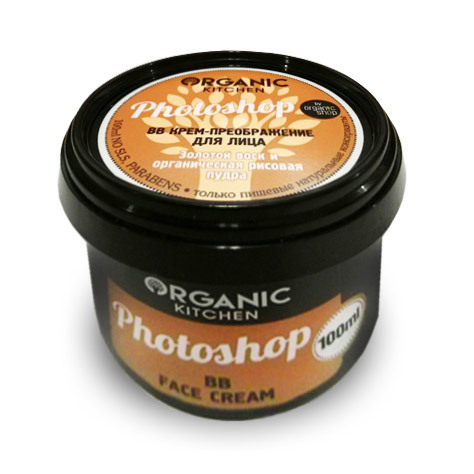 Photoshop BB Face Cream is produced by the Russian beauty brand Organic Shop for its Organic Kitchen series. The product is formulated with beeswax and organic rice powder. Paraben free. This BB cream effectively conceals skin defects, fills wrinkles, eliminates signs of fatigue on your face. As if by magic, your complexion becomes smooth and your skin looks healthy and glowing, just like in a beauty magazine. The cream contains beeswax that nourishes and protects your skin, relieves irritation, improves complexion. Organic rice powder excellently conceals imperfections and helps to regulate the hydro-lipid balance of your skin. Directions. Apply a small amount of cream onto dry, cleansed skin of your face and neck. Spread with light motions. You can use a sponge to apply cream evenly. Ingredients. Aqua, Octyldodecanol, Clycerin, Cetearyl Alcohol, Glyceryl Stearate, Caprylic/Capric Triglyceride, Carrageenan, Panthenol, Tocopheryl Acetate, Cera Alba, Organic Oryza Sativa Powder, Morus Nigra Fruit Extract, Carya Illinoensis Seed Oil, Sodium Stearoyl Glutamate, Xanthan Gum, Parfum, Citric Acid, Caramel, Benzoic Acid, Sorbic Acid. Want to buy Photoshop BB Face Cream? Call us or submit your order via our web site! I'll give this BB cream 3 stars out of 5. Korean creams are definitely much better (and much more expensive, of course). This one is more of a tinted moisturiser, it doesn't do wonders to my complexion. It's not too bad, just an okay product. More than okay if you consider its price.